As we reported yesterday (23 May), Google celebrated what would have been the 78th birthday of synth pioneer Bob Moog by turning its homepage logo into a playable Minimoog-style synth. In the video above, Moog chief engineer Cyril Lance demonstrates how the doodle works, giving a quick lesson on the basics of synthesis in the process. 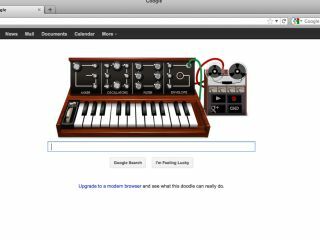 Want to really see what the Moog Google Doodle can do though? Then check out MusicRadar favourite (and occasional contributor) Brett Domino jamming out a rendition of Daft Punk classic Aerodynamic in the clip below. In other Moog news, the company has reduced the price of its popular Animoog iPad and iPhone wavetable synth apps. The iPad version is reduced to £6.99 (from 20.99) and the iPhone edition is just 69p until 29 May.